Musheer Hussain, Edward Fisher, Robin Youngs, Jonathan Fishman,	The Journal of Laryngology & Otology, Volume 130 Issue 9, p 793. A Price, R Eccles,	The Journal of Laryngology & Otology, Volume 130 Issue 9, pp 794-799. S Shemesh, S Tamir, A Goldfarb, T Ezri, Y Roth,	The Journal of Laryngology & Otology, Volume 130 Issue 9, pp 800-804. S A C Mackeith, I D Bottrill,	The Journal of Laryngology & Otology, Volume 130 Issue 9, pp 805-810. S Romsaithong, K Tomanakan, W Tangsawad, S Thanaviratananich,	The Journal of Laryngology & Otology, Volume 130 Issue 9, pp 811-815. J L Tan, J Tang, S Lo, S Yeak,	The Journal of Laryngology & Otology, Volume 130 Issue 9, pp 816-821. A Jain, S J Frampton, R Sachidananda, P K Jain,	The Journal of Laryngology & Otology, Volume 130 Issue 9, pp 822-826. N Choudhury, A Hariri, H Saleh,	The Journal of Laryngology & Otology, Volume 130 Issue 9, pp 827-832. V Noronha, C Goswami, S Patil, A Joshi, V M Patil, V Murthy, S Arya, S Juvekar, S Goud, K Prabhash,	The Journal of Laryngology & Otology, Volume 130 Issue 9, pp 833-842. K Sagawa, N Uwa, T Daimon, M Sakagami, T Tsujimura,	The Journal of Laryngology & Otology, Volume 130 Issue 9, pp 843-849. M Stavrakas, I Nixon, K Andi, R Oakley, J P Jeannon, A Lyons, M McGurk, T Guerrero Urbano, S Thavaraj, R Simo,	The Journal of Laryngology & Otology, Volume 130 Issue 9, pp 850-859. S Sharma, D A Chaukar, S G Laskar, N Kapre, A Deshmukh, P Pai, P Chaturvedi, A D'Cruz,	The Journal of Laryngology & Otology, Volume 130 Issue 9, pp 860-864. M Fujiki, S Miyamoto, S Zenda, M Sakuraba,	The Journal of Laryngology & Otology, Volume 130 Issue 9, pp 865-872. E Agalato, J Jose, R J England,	The Journal of Laryngology & Otology, Volume 130 Issue 9, pp 873-877. 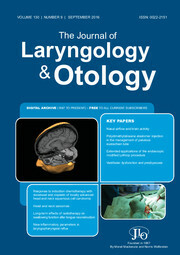 H Arslan, T Çandar, S Kuran, Ş H Akmansu, S Kocatürk,	The Journal of Laryngology & Otology, Volume 130 Issue 9, pp 878-882. F Keshtkar, O T Dale, W O Bennett, C E Hall,	The Journal of Laryngology & Otology, Volume 130 Issue 9, pp 883-886.